St Teresa of Avila advises us to, “Try and keep a good conscience.” In order that we might be successful in this we need to be honest and to pursue the way of truth and to be honest in all things. It strikes me that the insights of the saints were born of their own realisation of their own imperfections. So, maybe St Teresa, of whom I particularly fond, had an issue with her own conscience? To be sure, she knew both the agony and the ecstasy of belief and uncertainty; of light and darkness; of a life in the shadows, of the sacred and the profane. At the moment I am reading the document Gaudete et Exsultate. For those of you who may have missed this, it is Pope Francis’ encouragement to live a holy life in today’s world. 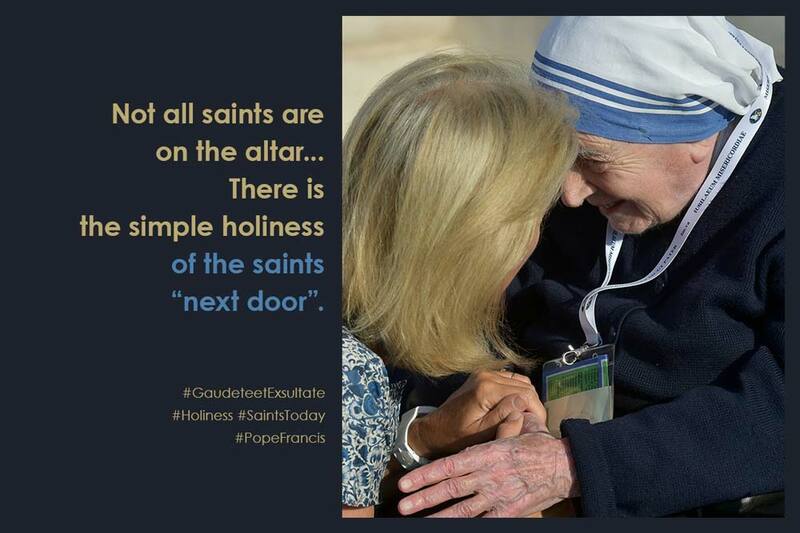 In sections 6 to 8 Pope Francis refers to “The Saints Next Door”, the ordinary men and women, (with their imperfections) some known but mostly unknown who nonetheless reflect God’s presence in our midst. The other week I had the amazing opportunity to reflect upon those “saints next door” in the life and work of the Fort Alice in Bolton for victims of domestic abuse. The stories that were shared were not for the faint hearted (and some in the meeting found it very heavy going). An issue that affects both men and women, I was truly humbled by examples of the courage of the staff both voluntary and otherwise who, quite literally, put their own personal safety at risk to care for and support people who are in the most shocking, oppressive, brutal and destructive of situations – relationships is entirely the wrong word. The Saints next door. When we reflect upon the Easter story we are inevitably led towards the belief of transformation, healing, release and freedom even from death itself. This is not simply an event of 2,000 years ago. Harry Williams, the former Dean of Trinity College Cambridge and Chaplain to the Prince of Wales, writes that, “The ultimate human misery consists simply in not being able to love.” I would commend his works to you and perhaps most especially his book The True Wilderness. Jesus’ Resurrection is precisely about the victory of God’s love not just in the past but also something that we are all involved in today. We are loved by God and he wishes to bring love into the shadows of our own lives and into the lives of those around us – bringing and seeing Resurrection in acts of love. So there is a reality about the Easter narrative now, just as it was when Jesus physically rose victorious on that first Easter morning. We perceive and glimpse this victory in the work of Fort Alice (and other places too) when love is given, hope restored and healing felt through the lives, commitment, dedication and genuine compassion of those saints next door.